Thailand’s largest island, nicknamed the ‘Pearl of the South’, is particularly spectacular during the Vegetarian Festival. Celebrated by Phuket’s Chinese community, the event marks the beginning of the month of ‘Taoist Lent’, when devout followers of the Tao abstain from eating all meat and meat products. 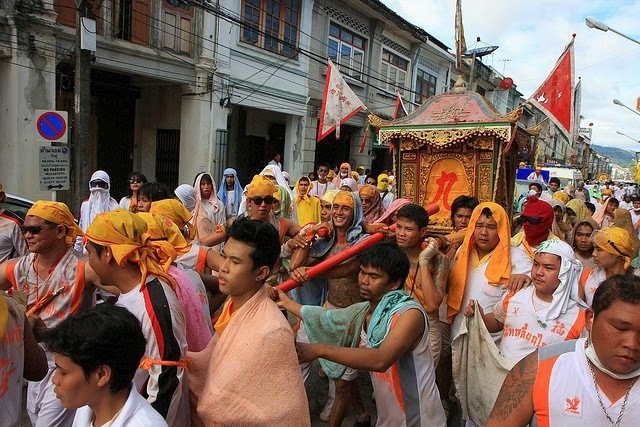 The festival begins with processions, religious offerings and cultural performances, centred on five Chinese temples. The most significant location is Jui Tui temple, the modern annex of Put Jaw, the oldest Chinese temple in Phuket Town.